Celadon lion-shapit Bixie (Cheenese: 辟邪), Wastren Jin period, 265-317 CE. Cheenese statue o a Bixie. A Bixie (Cheenese: 辟邪; pinyin: bìxié, Japanese: 辟邪, へきじゃ, Hekija), is a teep o lion-like meethological Cheenese creatur, or chimera. It is considered as an exorcisin animal (辟邪 leeterally means "Avoid Evil") an is uisually hornless. The Bixie can hae a pair o wings, which maks it rather similar tae the Tianlu (Chinese:天禄, Japanese: 天禄, てんろく, Tenroku) in follaein early Cheenese sculptural tradeetions o winged celestial beasts. The Bixie mey hae been an adoption frae Mesopotamie airt, through Persie an Bactrie, as a consequence o extensive trade relations initiatit bi Emperor Han Wudi durin the Han period. 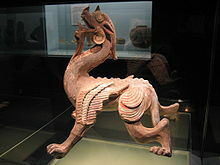 Some wastren scholars o Cheenese airt uise the wird "chimera" generically tae refer tae the bixie, qilin, an tianlu. Wikimedia Commons haes media relatit tae Bixie. This page wis last eeditit on 6 Mey 2018, at 21:05.